By Send2Press Newswire on September 23, 2010 in Finance, New Jersey, Press Releases, Taxes and Accounting, WALL, N.J.
WALL, N.J. (SEND2PRESS NEWSWIRE) — Peter Grandich, founder of Trinity Financial Sports & Entertainment Management Company, Atlantic Avenue, announced that former NHL(R) New York Ranger hockey player Ron Greschner has joined the company’s advisory board. Grandich explains that the purpose of Trinity Financial Advisory Board is to provide guidance to the firm’s unique niche clientele. Through their own life experiences, Christian advisory board members can help guide athletes and entertainers through many of the challenges that celebrity can often bring. From 1974-90, Ron Greschner played 16 seasons in the NHL – every game with the NY Rangers. He played 982 games in his career scoring 179 goals and 431 assists for a total of 610 points. He also compiled 1226 penalty minutes. His best offensive season was 1977-78, when he scored 24 goals and 48 assists for 72 points, all career highs for the defenseman. Born in Saskatchewan, Canada, Greschner is ranked No. 12 on the all-time list of New York Rangers in the book 100 Ranger Greats. Currently, he heads the Ron Greschner Foundation to support autism research and awareness (www.RonGreschnerFoundation.com). Founded in 2001, the nonprofit agency is dedicated to raising money and awareness for children with autism. He and wife Lori have five children. “I’m honored to be part of a great advisory board and the work Trinity does in the community,” Greschner says. Trinity Financial, Sports & Entertainment Management Company offers a variety of services for individuals and small to mid-sized businesses. Additionally, through the assistance of co-founder and company consultant Lee Rouson, former New York Giants running back and two-time Super Bowl Champion, Trinity Financial offers specialized services for professional athletes and entertainers. Peter Grandich is also a member of the National Association of Christian Financial Consultants. His daily financial blog, The Grandich Letter, is read online by thousands of investors at www.grandich.com . The company is located at 2431 Atlantic Avenue, Manasquan, NJ. For information about Trinity Financial, go to www.TrinityFSEM.com . 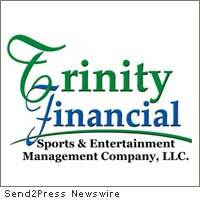 News Source: Trinity Financial Sports and Entertainment Management :: This press release was issued by Send2Press® Newswire.